Click to purchase the bill stuffer. 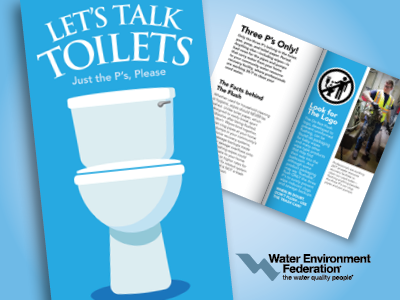 The Let’s Talk Toilets Bill Stuffer communicates that only the three P’s – pee, poop, and toilet paper – belong in the toilet. The Water Environment Federation (Alexandria, Va.) released this bill stuffer to help utilities educate customers about the need to prominently label wipes that do not disintegrate during the treatment process with a “Do Not Flush” logo. It also promotes understanding of how other objects can harm the pipes and pumps that make up local water resource recovery facility infrastructure. These and other bill stuffers can be mailed or handed out during meetings, exhibits, tours, and school programs. For a complimentary sample of any brochure or bill stuffer, call 1-800-666-0206 or email csc@wef.org.